Here’s a link to my latest blog post on my channel at SageWoman on the Witches and Pagans site. Blessings of the Samhain tide! We live in a culture and a world of avoidance. Television, social media, alcohol and drugs are just a few escape routes we have to avoid truly knowing who we really are. At this time of year, when Samhain is fast approaching we cannot avoid the very real fact that we will die, that death is unavoidable, though we may try. Looking at death straight in the eye can reveal some very hard truths about ourselves, about how we live in the world, and what our responsibility and duty is to the ancestors, not only ancestors of the past but perhaps more importantly, ancestors of the future. Continued… to read the full blog post, click HERE. In Druidry many see the gods as being many, in a polytheistic approach. Some see them all as aspects of one deity, or of nature itself as a single entity, which is a more pantheistic approach. But what lies beyond the concepts of polytheism and pantheism? I don’t know yet, I just thought I’d throw that question out there. After many brilliant short essays on the nature of the soul in a Celtic context, Tom Cowan towards the end of his fabulous book, Yearning for the Wind tantalises us with something similar. In an exercise that he suggests, we are offered the opportunity to try to see the soul behind the soul. While Cowan seems to willingly accept a single Creator deity (which doesn’t feel right to me, I’m much more of a “everything is soul and soul is everything” without the need for any one Creator or Creatrix) he does speak of a certain “yearning” for the soul to express itself. For me, this is close to what I’m currently exploring in terms of everthing being an expression of either a collective soul or an ongoing soul that has no begninning and that has no end. I’m not satisfied with the Big Bang Theory (the scientific theory, I love the show), in that there has to be a starting point for all creation. I see the universe as constantly being in flow, things arising and falling away, matter being transformed into other things along the way. Carl Sagan said “ The nitrogen in our DNA, the calcium in our teeth, the iron in our blood, the carbon in our apples pies were made in the interiors of collapsing stars. We are made of star stuff.” I’ve no burning need to document a start point for this process, for I simply don’t see one; when does the life cycle of an oak tree begin? When the acorn grows on the branch? When it falls to the ground? When the seedling emerges from the soil? Half of me existed as an egg in my mother’s womb while she was growing in her own mother’s womb. When did I start to be? Continued – to read the full article, click HERE. Zen Buddhist monk Thich Nhat Hanh suffered a massive stroke and brain haemorrhage last year, which left him incapacitated for many months. He is now able to move slightly, and recently managed to utter his first few words (pictured on the right). His joy for life, whatever suffering he may be going through, is an inspiration to all. He has changed some of his therapists’ lives through his example of mindfulness, one therapist even breaking down and crying when she realised just how she had never really seen the beautiful blue sky before in San Francisco. Thay couldn’t yet speak, however he did was point to the window to remind her of the beauty of the sky and the gift of opening our perception to it. It changed her world, and they were both happy. The beauty and wonder of the present moment is there for us all. All we have to do is open our perception to see it. In the midst of great suffering there is the possibility of great compassion. In this compassion there is the power of love and beauty, two words that may be bandied about recklessly in our modern-day, but words, concepts and energies that have real power within them. Through our suffering, we can make small steps towards awareness and mindfulness by becoming awake and aware, thereby easing our suffering and that of the world around us. We notice things that we wouldn’t otherwise notice in our suffering, as we turn our gaze outwards and perceive the world in its entirety rather than just our own suffering. Thich Nhat Hanh is a wonderful example of one who has seen and experienced the suffering of war, of exile, of persecution and physical trauma and still sees the power of love and beauty in the world around him. When I suffer, I shall breathe in and out, look at the sky, the trees, into the eyes of a loved one and know happiness and joy, there finding the deepest gratitude for my blessings. As Zen Buddhist monk, Thich Nhat Hanh’s health slowly begins to improve, he still provides an example of finding the joy, enchantment and wonder of the simplest things in life – eating a bite of food, taking a step upon Mother Earth, smiling at a friend. Reading this latest update on his recovery, it really brought home the message that we can find joy anywhere, if we are able to open our hearts to it. Despite circumstances that prove a tremendous difficulty, this gentle monk who has lived through war and exile continues to lead by example. Thank you, and bless you, Thay for your teaching. May we be worthy students, and may we all find the joy and peace that is to hand in mindfulness. Imagine my delight when I read how practices I am currently doing in my Druid tradition are also being done by the venerable Zen monk Thich Nhat Hanh (you will notice quite a few blog posts dedicated to his teachings on this blog!). In his book The World We Have: A Buddhist Approach to Peace and Ecology he provides some lovely daily practices (gathas) to honour the earth that we can fit into our everyday life. Some of these I was doing already in various forms, such as prayers before meals, washing hands/body, drinking water, etc, and some were new and equally poignant, to be incorporated in my daily practice. But what really struck a chord with me was the Five Earth Touchings that he described after the Earth gathas and how similar they were to my daily prayers. He recommends to Touch the Earth each and every day, to establish our deep and abiding connection with the earth and to give thanks for all that we have, reminding ourselves of who we are, where we came from, our ancestors of the future and living a life filled with compassion and peace. He states “The practice of Touching the Earth is to return to the Earth, to our roots, to our ancestors, and to recognize that we are not alone but connected to a whole stream of spiritual and blood ancestors. We are their continuation and with them, will continue into the future generations. We touch the earth to let go of the idea that we are separate and to remind us that we are the Earth and part of Life. When we touch the Earth we become small, with the humility and simplicity of a young child. When we touch the Earth we become great, like an ancient tree sending her roots deep into the earth, drinking from the source of all waters. When we touch the Earth, we breathe in all the strength and stability of the Earth, and breathe out our suffering- our feelings of anger, hatred, fear, inadequacy and grief. The first Earth Touching is “In gratitude, I bow to all generations of ancestors in my blood family.” Here we honour our blood ties, the stories that brought us to where we are today, the generations of love and suffering in our bloodlines that help to create our story today. By opening ourselves to our ancestors we acknowledge all this, and can ask for their protection, love and support. In Druidry, we honour the ancestors, and in my own tradition I state “I honour the ancestors of blood, whose stories flow through my veins”. The third Earth Touching is “In gratitude, I bow to this land and all of the ancestors who made it available.” Here we honour the spirits and/or ancestors of place, who have made this world that we live in. They are in the soil and wind, all those who have lived and died and now exist in another form. It is the energy of the land upon which we live, that we can feel humming in our bones, if we only open ourselves to listen. In my tradition, I state “I honour the ancestors of place, whose songs flow through this land”. The fifth Earth Touching is “In understanding and compassion, I bow down to reconcile myself with all those who have made me suffer.” Here we learn that the earth gives of her energy without discrimination or prejudice, and we can learn to live magnanimously in all that we do. We understand that people who cause us to suffer do so through their own wrong perceptions, and we pray that they find a way to relieve their suffering. We work towards not holding any anger or hatred towards these people, instead trying to understand in order to better work in the world. Again, we can ask our ancestors for help in this matter. In my tradition, I state “May peace be in the hearts and minds of those who cause me and others around them to suffer, may they know loving kindness. The similarities between what I currently do as a Zen-minded Druid and these Buddhist practices absolutely delight me, and could to transform much of the world’s suffering if done with mindfulness and loving kindness. Try to take some time each day to recite the Earth Touchings above, or something similar – it could change your life, or at the very least ease some of the suffering and provide a path to peace that is yours and yours alone to walk. Whilst on holiday in Brittany the past week (blog and photos to come!) 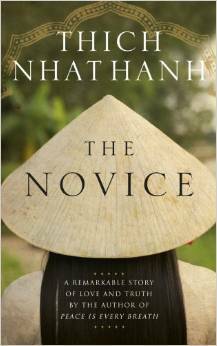 I read Zen monk Thich Nhat Hanh’s novel, The Novice. It is his first novel, that tells the story of a young woman who has become a legend in Vietnam for paving the way for women to be nuns in the Buddhist tradition. It’s a short book, eloquently written and filled with wisdom throughout. Kinh Tam is a beautiful young woman who has always felt a calling for deep learning through Buddhist enlightenment. As there were no temples for nuns at the time, she felt that her only option was to do what women did back then – marry and have children. However, her marriage failed as her in-laws falsely accused her of trying to kill her husband one night. Kinh Tam goes back home then, cuts off her hair and disguises herself as a boy, wandering for five days until she comes to a temple where she asks to be taken in as a novice. She shows an aptitude unlike any other monk in her devotion to the Zen Buddhist teachings and carrying them out. She lives the perfections of generosity, mindfulness, magnanimity, diligence, patience and insight. She has already been through much, after the false accusations of attempted murder, and yet she holds true to her path, holding no malice to those who have wronged her through their own false perceptions. A young noblewoman who visits the temple falls in love with the young “boy” monk, seeing in him such beauty that only an open-heart can radiate. Kinh Tam avoids her, with as much compassion as possible, as her secret cannot be found out else she faces expulsion. After Kinh Tam turns down the noblewoman’s request for a private meeting, the noblewoman woman becomes enraged, filled with her own anger and wounded pride, accusing the young novice of impregnating her when it was really a servant boy from her household whom she took to bed in anger and despair of not being able to sway the young novice from his devoted path. Kinh Tam faces the dilemma of choice: tell everyone that it’s not possible, as she is a woman, or face beatings for her “transgressions”. Her love for her path is so strong that it sees her through the beatings, and yet again she never holds any malice towards the young woman (Mau), those who believe her false accusations and even those who beat her. She knows it is only their wrong perception of her that makes them act as they do, and the strength of loving kindness overcomes all the pain she endures. Kinh Tam goes through further hardships, yet always with the endurance of a loving heart and the deep well of forgiveness. I won’t tell you the ending, but I was in tears as I read it – it was just so beautiful. Kinh Tam’s story is one that can help anyone going through a rough time. It doesn’t matter what it is that you are enduring, whether it is being shot at, beaten, false accusations or someone trying to undermine you and your work – the open heart of compassion and seeing the unity of all things is stronger than any of these. Anyone can relate to Kinh Tam’s story. As a woman, I felt a deep bond with her struggles and an empathy for her trials and tribulations. I felt deeply the tug of sadness as one woman falsely accuses another (albeit unknowingly regarding the disguised gender, yet with an intended malice in any event). As a practitioner of Zen I found deep wisdom in the teachings that lay like little stars filled with light across the pages, twinkling with their insight into living a life of less suffering. We all suffer, for various reasons, but we can lessen that suffering through the open heart of compassion. Those who try to hurt us, physically, emotionally, intellectually, who undermine our person and our work, who tell lies and allow their pride, anger and other emotions to overwhelm their reason and the ability to see clearly the heart of the matter – these are things we all go through at some point in our lives. Whether it is through war, office/work politics or family issues, the cause is the same: wrong perceptions. Because they have a wrong perception of us, they act out, lash out, are ruled by the monkeys riding on their backs. Yet we don’t have retaliate like for like. We can see their suffering, and still send them our love and compassion, even from afar. Because they perhaps have not seen that there is another option, they have no way out. Living through our actions, of opening our eyes to all possibilities and the reality of the present moment we can hopefully provide an example for a peaceful way of life that benefits the whole. We can forgive these misjudgements from others, as they are easily created. Through diligence we can work to dissolve these false perceptions within ourselves, through meditation, deep insight and the other teachings of Zen Buddhism. I always doubted whether humans were truly capable of forgiveness. When explained through the words and story told by Thich Nhat Hanh, it makes so much more sense; it is so easy. 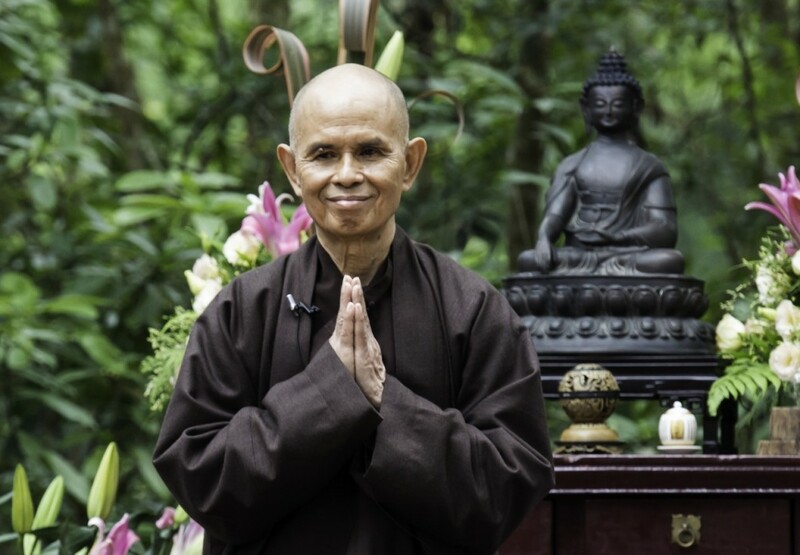 There are three appendices to the story, one describing further the legend of Kinh Tam, the second describing the legacy of Kinh Tam by Sister Chan Khong of Plum Village monastery, and Thich Nhat Hanh’s own addendum about practicing love. These appendices are just as important as the story itself, for it shows “Engaged Buddhism” in action as Sister Chan Khong and Thich Nhat Hanh both relate how the practice of compassion helped them through the suffering of the Vietnam war, exile and more. We see first-hand how the Zen Buddhist precepts are put into practice, actually lived out in the lives of those who worked in the DMZ, offering wisdom and deep insight into how suffering is different for each individual and yet can be overcome when held in the arms of compassion. In the UK, you can buy this wonderful little book from as little as £1.04 second-hand; do try to read it if you are at all interested in Zen Buddhism, mindfulness, compassion or loving kindness. If you feel you are suffering in any shape or form, this book might be able to help you find the way to transforming suffering into something that instead brings peace and harmony to your world, and thereby to the world at large. Just beautiful. Recorded in Plum Village Monastery (set up by Thich Nhat Hanh) by Tabea with the loving support of Sister True Vow.